On July 3, 2013, the Egyptian military staged a coup d’etat and deposed the democratically elected government of President Mohamed Morsi of the Muslim Brotherhood. Thousands of Egyptians staged demonstrations throughout Egypt to show support for Morsi. One month later, the Egyptian army and police carried out several massacres in Cairo, killing hundreds of unarmed protesters. Authorities mounted a military response to largely peaceful protests by supporters of the Brotherhood against the illegitimate Egyptian government. Although aimed primarily at the Brotherhood, the crackdown included other political opposition groups and individuals. 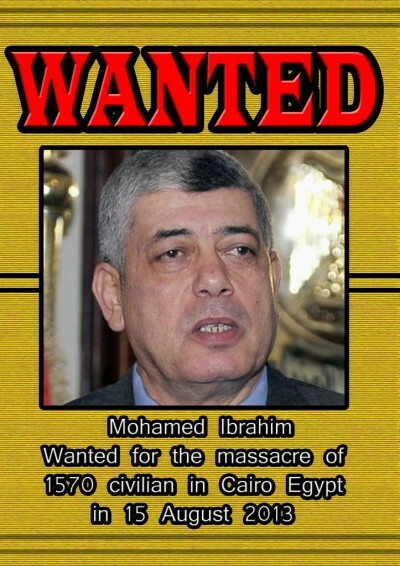 Four Dutch citizens of Egyptian origin, who were present during three of the most brutal massacres in summer 2013, filed a petition in the Netherlands that charged Egyptian Interior Minister Mohamed Ibrahim with crimes against humanity. In September 2014, the Dutch law firm of Seebregts & Saey submitted a formal request to the Dutch prosecutor to prosecute Ibrahim. Dutch criminal courts have jurisdiction under the International Crimes Act when a Dutch national has been the victim of a crime. Due to head of state immunity, the lawsuit did not name Egyptian President Abdel Fattah el-Sisi, who ordered the Rab’a massacre when he was Defense Minister. There were over 20,000 protesters in Rab’a Square. In what HRW called “the gravest incident of mass protester killings,” Egyptian police, snipers and military personnel opened fire on unarmed demonstrators on August 14, 2013, “killing at least 817 and likely more than 1,000.” Security forces used live ammunition “with hundreds killed by bullets to their heads, necks, and chests.” Snipers fired from helicopters over Rab’a Square. The deaths “amounted to collective punishment of the overwhelming majority of peaceful protesters,” HRW concluded. One of the petitioners, who was present at the demonstration, was not wounded but people on his left and right were being shot. He was also present when the authorities set fire to the hospital on Rab’a Square, killing about 300 patients who were not able to leave. On July 7, 2013, about 2,000 Brotherhood supporters began a peaceful sit-in. Shortly before dawn on July 8, police and army units opened fire, targeting those in the protest and others emerging from prayers at the mosque. Authorities killed 61 protesters with live ammunition and injured 435. Most suffered gunshots to the head, neck and chest. One of the petitioners was hit by a bullet, but survived. The two petitioners who were present at this demonstration were not wounded but were in danger of being hit. Others a short distance away were hit by bullets. Dutch law provides for sentences up to life in prison for convictions of crimes against humanity. The crime is defined as intentional killing or other inhumane acts of a comparable nature which intentionally cause severe suffering or severe physical or psychological damage, when committed as part of a widespread or systematic attack against a civilian population pursuant to State policy. The Rab’a massacre was “executed pursuant to a plan formulated by the Interior Ministry and approved by the Cabinet and National Defense Council after three weeks of preparation,” HRW determined, citing statements of Ibrahim that he anticipated the dispersal would kill large numbers of demonstrators. Ibrahim made public statements revealing he knew beforehand that many people would die during the police and military actions to end the demonstrations. The day after the Rab’a massacre, Ibrahim said “the dispersal plan succeeded 100 percent,” indicating that it adhered to a plan that had been put in place. Morsi was convicted of charges including incitement to violence and torture from 2012 demonstrations that resulted in the deaths of 10 people outside the presidential palace. He was sentenced to 20 years in prison. The case against Ibrahim is under consideration by the Dutch prosecutor’s office. Should the prosecutor refuse to prosecute Ibrahim, the petitioners can request that the superior court in The Hague order the prosecutor to prosecute. There has been no legal accountability for the massacres conducted by the Egyptian military government against the largely peaceful protesters. If high government officials in Egypt are permitted to commit crimes against humanity with impunity, it will encourage similar actions in the future – both in Egypt and elsewhere. Since there is little prospect for justice in Egypt itself, the Dutch lawsuit may be the only vehicle for accountability for these most serious crimes.